It’s not quite from the cradle, and hopefully I’m not quite ready for the grave as yet, but I’m truly delighted to have been asked by Packet of Three to talk about my Squeeze adventures, which definitely lie in-between the two. If I may begin at the latest point in time, 19th November 2014 Warwick Arts Centre, Coventry and the final date of Chris Difford’s and Glenn Tilbrook’s ‘At Odds Couple’ tour, celebrating their 40 year musical marriage. It had been with a sigh of relief when, at the final hour, a business cancellation allowed me to make last minute arrangements to see these guys reminisce on their journey, which had touched my life in so many ways. Apart from the hotel being slighted overrated in my Google search, everything else went splendidly. The train journey seemed to encapsulate memories and as we pulled out of Chesterfield station, feeling slightly dishevelled after a long day, I found myself a seat. Tucking into an unfinished sandwich I had bought earlier, I reflected on past times, which began on March 8th 1978. I doubt it was the precariously positioned towel over the guitarist’s head, whilst mischievously playing with the neck of his guitar, or the cigar smoke billowing out from behind the keyboards that evoked my curiosity to these five musicians, but something definitely struck a chord that night at the City Hall in Sheffield. And it was from then on that the next few years of my life made a surprising detour. 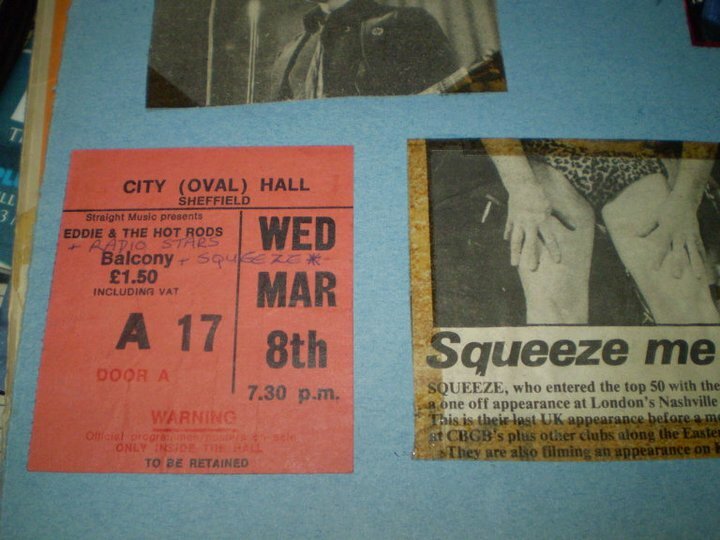 Squeeze took pride of place on my bedroom walls, in my diary and most of all within my record collection. Their tour dates were scrutinised and planned with precision. Once published in the latest edition of the NME there would instantly be ticks against the ones I could attend, a cross beside the few I couldn’t, and the possible ones ‘question marked’ for review at a later time. Everything else became secondary and just like most teenagers I embarked on my new journey with excitement and wonder. Thirty six years later and through a chance meeting with David Bailey at the Warwick Arts Centre, I am dusting down the old photographs and memorabilia in order to share some of those cherished and fun times with you all. I feel privileged to have been asked to pen a series of blogs written through the eyes of a Squeeze fan, music lover and now in the midst of my life to look back on these days with fondness and smiles. 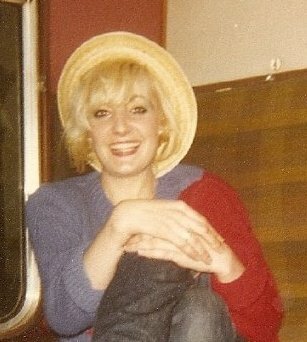 4 Responses to "Squeeze Fan From the Cradle to the Grave"
I’m looking forward to reading your forthcoming blogs Sharon. So am I Tyrone! 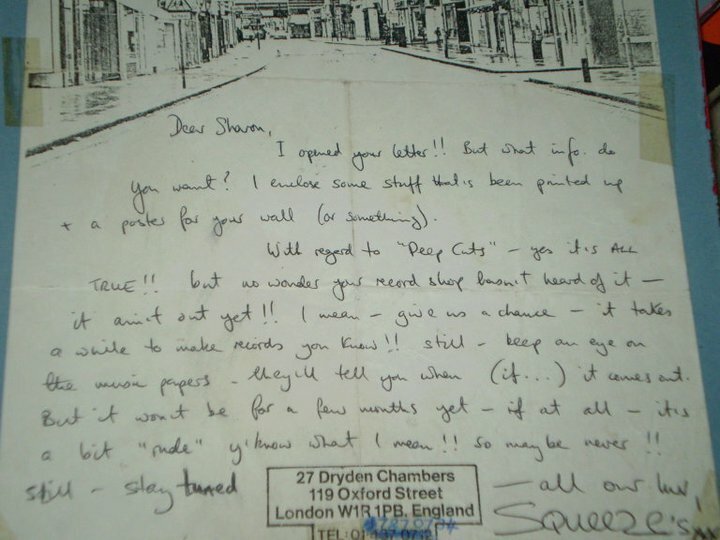 Sharon and I met back in 1980 and she’s a true treasure trove of wonderful Squeeze information – she’ll amaze you! Thank you Tyrone! I am looking forward to writing them too! Loved reading about your Squeeze adventures. As a U.S. fan, I’m jealous that everyone in the U.K. is getting a chance to see Chris and Glenn’s tour. I’ve been lucky enough to see Mr. Tilbrook in Denver the past two years though. He did hint to me that both of them might be coming to this side of the Atlantic at some point. I’m betting you will also be seeing Squeeze’s fall tour. Look forward to your “report”:).